Change is in the air! See three steps you should take immediately to keep pace with new requirements. Read on for a grounding in where we are and where we may be going. First, DOJ’s “new” 2010 rules are in effect. On the 20th anniversary of the ADA, President Obama signs an Executive Order increasing federal employment of individuals with disabilities. Recreational facilities including amusement rides, exercise machines and equipment; boating, fishing, golf and miniature golf facilities, play areas, swimming pools and spas. 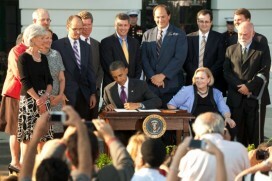 Second, the ADA Amendments Act (ADAAA) took effect January 2009. This feature focuses on DOJ’s rules. But a separate major development affecting disability rights laws is the ADA Amendments Act. It took effect on January 1, 2009, and makes the first significant changes to the ADA itself since its enactment in 1990. Congress passed the amendments in response to Supreme Court decisions that had interpreted the ADA’s definition of “disability” in a way that was much more narrow than Congress intended. Specifically, those cases had focused on the threshold issue of to what extent an impairment must “substantially limit” a major life activity in order to rise to the level of a disability. Under the amendments, it is expected that more individuals will now be considered individuals with disabilities protected by the ADA. Congress expressed its “expectation” that the Equal Employment Opportunity Commission (EEOC), responsible for employment issues under title I of the ADA, would revise its definition of “substantially limits” because of the ADAAA. The EEOC issued implementing regulations in March 2011. After hearings and public comment on these advance notices of proposed rulemaking (or “pre-rules”), which closed January 24, 2011, the next step is for DOJ is to prepare proposed regulations for further comment. The Department of Justice (which issues regulations under title II, state and local governments, and title III, public accommodations and testing/licensing entities) has begun revising its regulatory definitions under the ADA and section 504 (in response to the ADA Amendments Act). Then we can anticipate conforming regulations from the Department of Education and others under section 504. The section 504 regulations still allow recipients to follow the Uniform Federal Accessibility Standards (UFAS). But the DOJ regulations require compliance with the 2010 Standards for title II and title III, one of which will almost always apply to recipients who are subject to section 504. In 2011 DOJ reiterated its intent to work with Federal agencies to revise their section 504 regulations in the near future to adopt the 2010 Standards as the appropriate accessibility standard for their recipients. So far, only the Department of Education has stated generally that compliance with the 2010 ADA Standards will achieve compliance with section 504. DOJ has issued several technical assistance pieces about the 2010 regulations and plans to issue more. Areas covered include service animals, ticket sales, and effective dates and compliance dates. Learn the rules. The text of the rules (which is not very many pages, apart from the accessibility standards) is found here along with the “preamble” or analysis, which explains the changes and how DOJ has responded to comments. If you are responsible for any aspect of design, construction, or alterations, read the 2010 Standards (adopting the 2004 ADA Accessibility Guidelines, or 2004 ADAAG). More people with disabilities, and a greater variety of disabilities, and wider range of severity of disabilities, use your services. They bring a wider variety of service animals and emotional support animals. They use more technological devices. They use mobility devices that didn’t exist or were in limited use in prior decades. You have different or increased security and emergency evacuation concerns (not addressed specifically by the rules, but the subject of extensive DOJ guidance). You offer more types of programs and/or services and in different ways. You’ve probably built or altered some of your buildings or facilities, or you use them in different ways now. You probably have a web site that you use for sales or for communicating about your services. Be sure you have evaluated your policies in the areas where new requirements have been introduced. Then evaluate your operations in light of changing times and the changing needs of people with disabilities. Make any changes to facilities that are required for barrier removal or program access. The most effective way to take these steps is through a new or “refreshed” self-evaluation and transition plan (under title II) or a self-assessment and barrier-removal plan (under title III). Then be sure that those responsible for design, construction, or alterations are following the 2010 Standards. If you’re unclear about how and when to apply the new standards and how the new “safe harbors” work, read our Tips for the Transition to 2012. ADA Anniversary update: What's next from the Federal Government?! We understand the current regulations and the proposed changes. We stay current on developments. We can guide you in understanding how the changes may affect you and how to prepare, through our consulting and training services. The Department of Justice's ADA web site. The Access Board's web site.